Flight data are a great forecasting example because they display such clear seasonal patterns, in this case peaking in the summer months and falling off in the winter. R has excellent tools for working with time series data and whipping up simple forecasts like this one. But there’s some friction with the modern tidyverse tools, because the latter expect a data.frame as the common interchange format. In this post, I’ll outline an approach to fitting many time series models using the tidyverse tools, including model selection for out-of-sample performance. To ease the transition between these two worlds I make extensive use of list columns and the broom package. For this post I’ve extracted the data into a vector of R’s built-in ts class, which is the common interchange format for most time series packages. As of writing, I have data from January 2000 through August 2016. 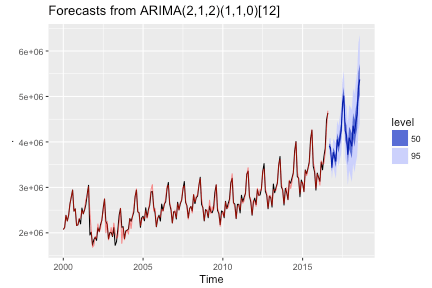 There are an overwhelming number of time series models used for forecasting out there (see the CRAN task view on time series for a sense of what’s available in R alone), but the most common ones are probably ARIMA and ETS, both of which can handle seasonal data sets like this one. In choosing a model for forecasting, what we care about is the accuracy of the model on unseen (that is, out-of-sample) data. Since we don’t have a way of measuring that directly, we simulate the experience by holding out a test set. We can use this training set to fit some ARIMA and ETS models, and see how they compare. R has built in support for fitting ARIMA models with, you guessed it, the arima() function. However, there are a number of shortcomings to this implementation, so I’d recommend using the Arima() version from the forecast package instead. You can also try your luck with the package’s auto.arima() function, which will try and find an optimal model automatically. Choosing the order of an ARIMA model usually benefits from some manual exploration of the autocorrelated errors, especially using the forecast::tsdisplay() plot. For brevity I won’t walk you through the process here, but I’d strongly recommend taking a look at Rob Hyndman and George Athanasopoulos’ chapter on forecasting seasonal data using ARIMA, which is freely available online. The automatic process selects an ARIMA model with low order, indicating that a simple model might fit this data reasonably well. Notice that this (ostensibly optimal) model has an AICc of 4912.794, which is much higher than the ARIMA models explored above. This may be an indication that ETS models are not a good fit for this data set. One can choose both an ARIMA and ETS model based on how well it fits the training data. However, when forecasting, better out-of-sample performance is the true goal. 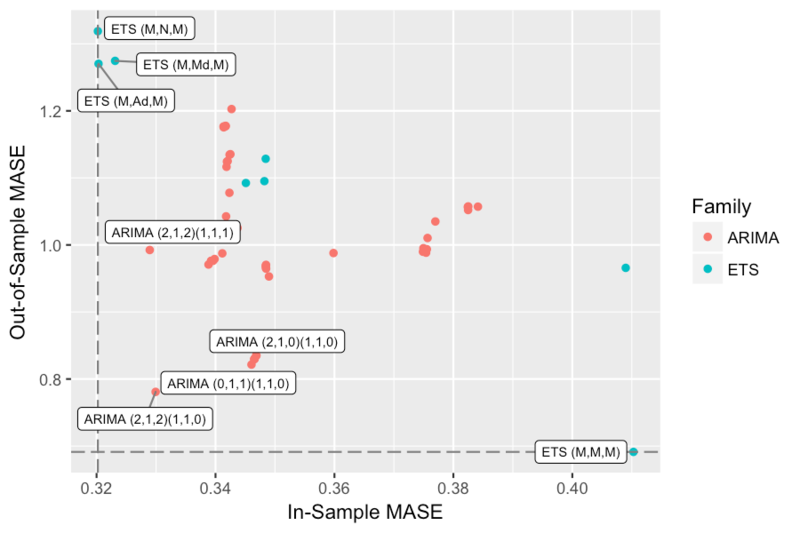 For this reason, I’m going to take a more systematic approach, fitting a wide variety of both ETS and ARIMA models and comparing their out-of-sample performance. Create columns for training data, modelling functions, and any other model parameters. Wrap these training data and model parameters into a single param column. Use purrr::map() and friends (or broom::glance()) to extract goodness of fit measures. # Drop combinations with a damped non-trend. # Create labels for the models out of these parameters. # Drop nonsensical models (these are flagged by `ets` anyway). With this set of model parameters in hand, we can create list columns containing the training data and the function to compute the model (ets in this case). We can also wrap up the parameters into a param list column by using the curious but useful transpose() function. # Add in the training set and the modelling function. # Create a "param" column to pass to `fn`. And now we can make use of invoke_map() to fit all of these models. I’ve also extracted the AICc values of each for comparison. # Fit the models, and extract the AICc. Note that the best-performing model here — ETS(A,N,A) — is the same one arrived at automatically above. We can do the same thing with the ARIMA models: generate a list of model parameters as a data frame, collect these into a param list-column, and then fit the function using invoke_map(). Unlike ETS, there are an infinite number of possible ARIMA models. However, we can guess from above that good models will have low order. # Create a label for the model. Since this data frame has the same form as the one used for the ETS models, we can concatenate them into a master list of models. The forecast() function is its namesake package’s universal forecasting function. We can use it to add a column of the two-year forecast for all of these models. The AICc is not a direct measure of forecast accuracy. Traditional root mean squared error (RMSE) and mean absolute error (MAE) are both options, although the author of the forecast package recommends mean absolute scaled error (MASE). The package provides the accuracy() function to compute all of these measures (and a few others) for any forecast object, but unfortunately it returns a matrix with meaningful row names, which would be hard to wrap up inside a list column. What we need is an API that returns a data frame. # Format the names of the measures to suit broom::glance(). if (length(names(res)) > 7) names(res) <- "thielsu"
Each accuracy measure provides a slightly different ranking of models. Does this list lay out which model is best? If what you are after is forecast accuracy, the answer is no. It is overwhelmingly likely that some models which perform exceptionally well on this training data may do poorly when confronted with new data. This is precisely why we left a “test” series aside earlier. You might have noticed above that the broom::glance() implementation above accepts a newdata parameter for out-of-sample accuracy assessment. We can pass the test data left aside at the start of the post in the same fashion as above, and lay out the in-sample and out-of-sample measures side by side. This is also a great opportunity for visual exploration! I’m going to use the ggrepel package to add cleaner labels to the top in-sample and test-set performers, although you can also substitute the built-in ggplot2::geom_label() here. # Pull out the out-of-sample RMSE, MAE, and MASE. # Join the in-sample RMSE, MAE, and MASE columns. # Find the top four models by in-sample and out-of-sample MASE. # Graph in-sample vs. out-of-sample MASE for the top 50% of each. # Vertical/horizontal lines at the minimum MASE for each sample. # Label the top models. This plot reveals some interesting patterns. First, it looks as though some of the multiplicative ETS models do quite well on measures of in-sample accuracy, but poorly when confronted with the test set (top left). Second, there is an ETS (M,M,M) model that does very well on the test set, but quite unremarkably on the training data (bottom right). To mirror this, the best in-sample performer has only middling test set performance (middle right). Third, the models that do well on both measures tend to be ARIMA models of low order (bottom left). What conclusions can we draw from this? Test set performance isn’t the ultimate arbiter of forecasting performance. As I mentioned above, you can overfit to this specific test set, which is probably what is going on with the high-flying ETS (M,M,M) model. The low-order ARIMA models strike me as a better choice. Okay, now that we’ve settled on a model, it’s time to actually forecast the series forward. It looks like the model fits the data quite well, aside from some trouble around 2003. 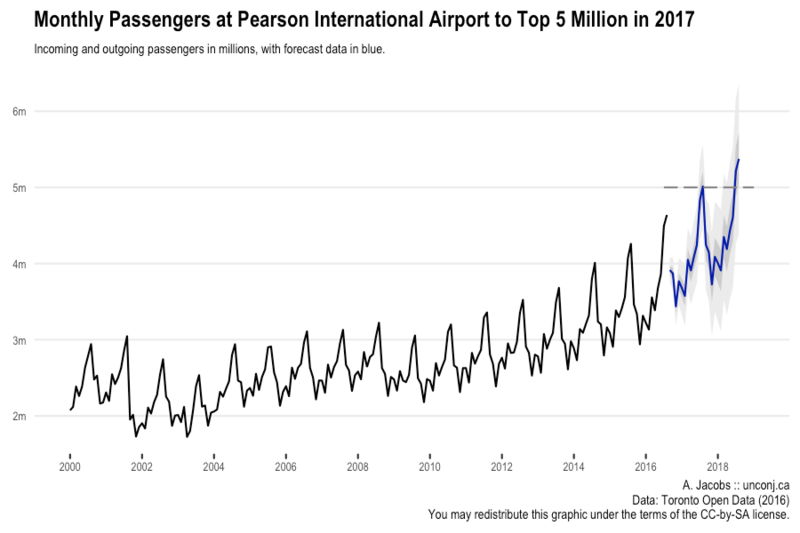 The forecast output also gives us a nice story to tell: monthly passengers at YYZ looks likely to break 5 million for the first time in summer 2017. The author of the forecast package has recently revealed that future versions of the package will provide support for computing cross validation-like residuals. I may discuss incorporating this function in a future post.